Whoopee! The View is back for its 21st season and it looks like the gang's all here despite rumors to the contrary. 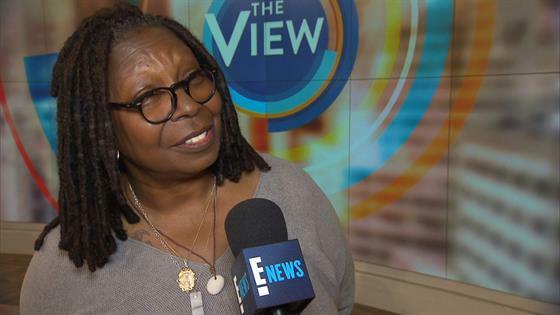 After 10 years on the controversial daytime show, Whoopi Goldberg revealed to E! News earlier today on the set of the ABC show that she was finally ready to call it quits—but something, or rather someone changed her mind. The 61-year-old told E! News, "I wasn't coming back but my daughter said I think that's a mistake because we've just had a major shakeup and you need to be a part of this conversation." The outspoken personality also explained that the stress of the job and the weight of people's opinions can get to her. Whoopi Goldberg Is The Only One Left On "The View"
"I never thought I would get in as much trouble as I seem to have gotten in. You have to be prepared for half the country to hate you every day. It's a lot to carry but that's why I try not to look back," she admitted. The panel, which now consists of Sara Haines, Jedidiah Bila, Paula Faris, Sunny Hostin and Whoopi, kicked off the new season with a clip that featured a look back at a decade "under the influence of Whoopi" and showed several tense moments, fun-filled spots and even flashed back to the comedy queen's first appearance as a moderator. Unfortunately for the funny lady, she's not a fan of surprises—even if it includes a visit from music legend Chaka Khan. When asked if she enjoyed the video tribute, the Oscar winner told E! News, "I wasn't happy. I don't like surprises. I am not good with them and they do them to me anyway because they just know I am going to totally freak out." "It's nice to see that I stand for something and that was nice to see. I would not have seen it, had I not seen [the tribute]," she confessed. If you don't stand for something, you fall for everything!